A welcome trend among businesses is recognising that the wellbeing of all staff is a fundamental feature of a constructive and productive culture. There’s no better way of showing your commitment and appreciation of your staff and their wellbeing than by including seated massage or corporate fitness into their work activities. Offering our massage and/or fitness and wellness services can help staff improve their health through their job. This takes much of the burden out of trying to fit these activities into everyday life. We have a huge array of services from our most popular seated massage through to our corporate fitness and yoga programs. We even offer mindfulness meditation if you’d prefer something less active. This means we can offer wellness solutions for a broad range of businesses and their staff, and create programs to suit those specific needs, with the frequency and range of activities totally up to you. There’s also plenty of noticeable benefits for businesses engaging these services, which will help your bottom line, ensuring that the advantages flow both ways. It’s a smart investment into your business and your staff, and provides a great point of difference when it comes to recruiting. Progressive corporations renowned for offering some of the best workplaces in the world, such as Google, offer corporate massage services in their workplace. So next time you’re looking for a way of rewarding your staff and letting them know how much you value them, particularly if you’re looking for a responsible solution with a focus on health, think about our range of corporate wellbeing services. 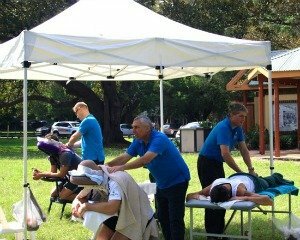 You can call us to find out about more specific solutions, with our massage services available at events, conferences and golf days, while our corporate fitness can cover a number of different focuses.